NASA's Mars rover Curiosity has stopped for maintenance after a short circuit disabled one of its arms. Testing and maintenance will take a few days. The Red Planet-exploring, epic-selfie-taking robot will sit idle for some time as technicians back on Earth find out where and how serious the problem is, says a status report on NASA's Mars Exploration website. 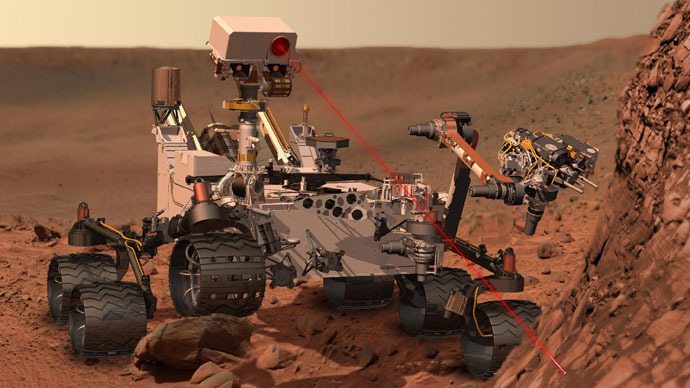 The malfunction was caused by a short circuit, which happened as Curiosity was transferring rock powder samples from the drill on the end of its arm to laboratory equipment inside its body. A picture of the drill was posted on Curiosity's twitter page. The same process has been completed without a hitch five times before during the two-and-a-half years the rover has been on Mars. NASA specialists say the rover has been stopped as more of a precaution. It's resistant to transient short circuits in some of the systems, but in others, it could disable an entire mechanism. The technicians want to be sure it’s safe before moving the arm again. "We are running tests on the vehicle in its present configuration before we move the arm or drive," said Curiosity Project Manager Jim Erickson, of NASA's Jet Propulsion Laboratory in Pasadena, California. "This gives us the best opportunity to determine where the short is." Curiosity recently made headlines with an epic selfie - a summary assembled from a number of pictures taken by the rover over the past five months of its mission. An annotated version of that photo was posted on NASA's website. Another photo taken by Curiosity earlier sparked speculation of life on Mars - after a scientist outside NASA suggested he spotted microbe traces on the picture. The discovery, which could mean there had been life on the Red Planet, was later turned down by NASA. Overall it's been exploring Mars since August 2012, having been launched from Earth in November 2011. Curiosity isn't alone on Mars. Opportunity, NASA's previous rover, is still active and mobile on the planet's surface after 11 years of service, though lately it has been experiencing memory loss. Mars is also littered with at least four more rovers, launched over the past decades by the USSR, the UK and the U.S., although no one knows for sure where they are, as contact has been lost with each of them.